Today's game is a special one, filled with many emotions. Football unites people together across the world. The precious game that we all love is a celebration of the family of football. On Friday, the horror of the Paris attacks shook the world and brought us together as one nation. 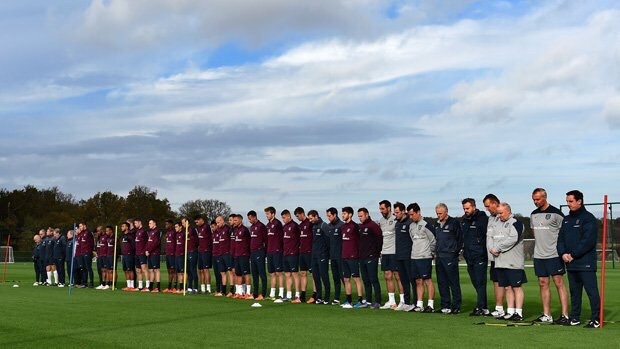 Today we will be observing a one minute silence at Wembley Stadium in memory of the innocent people that lost their lives and their families that are grieving. Also, in the stadium, the French national anthem will be displayed on the screens so that all the fans can sing along and pay their tributes. This is a great sign of how Football is more than just a sport. 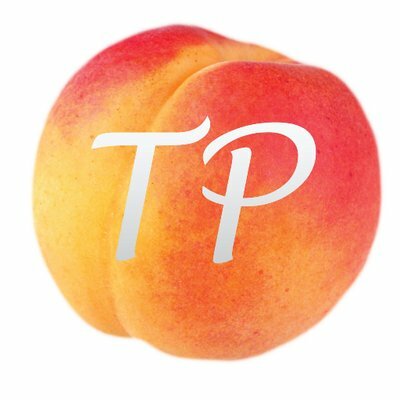 It is important to remember that there was a possibility that the game today would be cancelled. Now this fixture holds even more importance. Despite their previous loss to Spain, there were flashes of play to suggest that Hodgson's men have formed a good relationship between them. However, the problem still lies in the final third. Playing against a "world-class" team like Spain was exactly the wake up call that we needed after finishing top in our fairly mediocre group in the Euro qualifiers. 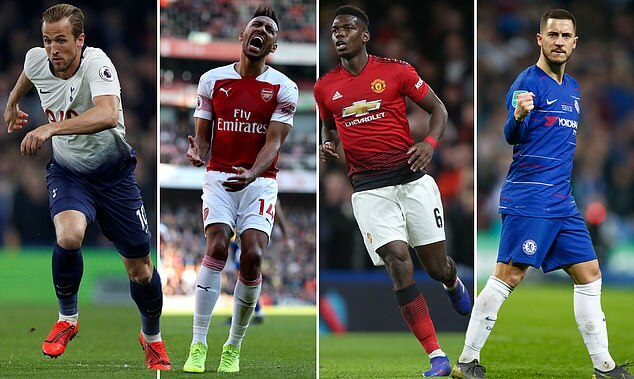 Players such as Hugo Lloris, Paul Pogba, Antoine Griezmann and Anthony Martial will be players to watch out for. 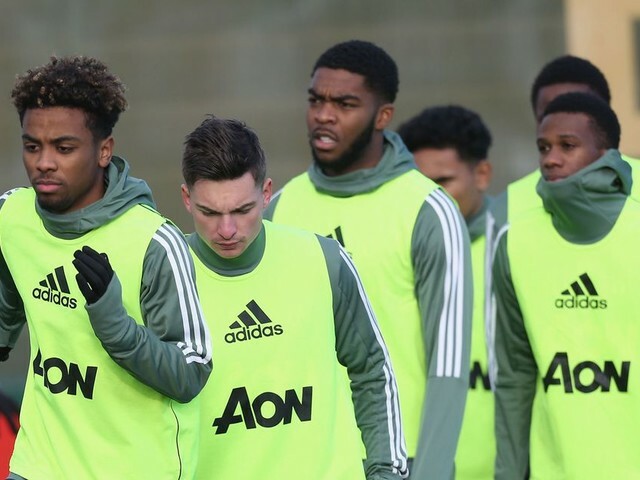 Our latest addition to the squad, Manchester United's shining youngster Jesse Lingard will be hoping to earn his first cap for his country after having been called up from the U21s squad following injuries of Carrick and Vardy. Jesse Lingard has performed well in the few games that he's played this season and in his last game against West Brom, he scored his first Premier League goal. It will be interesting to see how England play against one of Europe's finest teams. One can only stress whether Hodgson will start Wayne Rooney, or will he opt for the man in form, Harry Kane. Ryan Mason has also been called up to the senior squad, we would like to congratulate him for this. The Tottenham midfielder has not started a league match since September. France are a great team with a good history. However, the main talking point about today's game will be whether Friday's attacks will affect them psychologically. 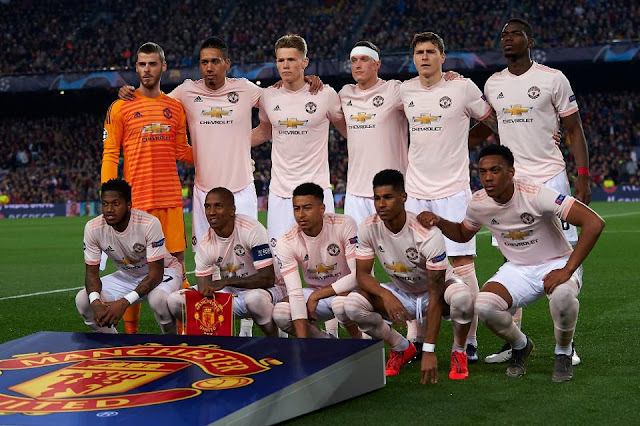 Didier Deschamps will be hoping that his men can prove that they will not let the tragic events caused by the attacks stop them from being united as a country. In France's last game they beat Germany 2-0 at home. 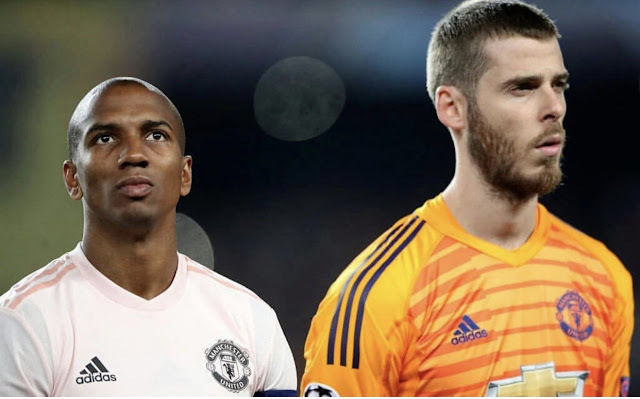 France have a very talented squad with the experience of Lloris and former United player Patrice Evra, coupled with the sensational skill of the young players in Pogba, Griezmann and Martial. The game will be an excellent display of technical ability but will be a difficult one for England. Both teams are contenders for winners of the Euro 2016 Championships so it will be an interesting fixture to see how the teams play. The team-lists have been published for this highly anticipated game. England: Hart, Clyne, Cahill, Stones, Gibbs, Dier, Alli, Barkley, Rooney, Sterling, Kane. France: Lloris, Sagna, Varane, Koscienly, Digne, Schneiderlin, Cabaye, Matuidi, Ben Arfa, Gignac, Martial. On paper these are two very strong teams. I would say that France edge it in terms of quality. They have a brilliant goalkeeper in Hugo Lloris. Their defence of Sagna, Varane, Koscienly and Digne are very strong and will be up for a physical battle with the English forwards. The midfield of France is a quality one with a real strength-in-depth; the vision and passing ability of Schneiderlin with the creativity of Cabaye and the pace and power of Matuidi. The French attack consists of Ben Arfa, Gignac and Martial; three very dangerous players. Look out for our United players: Schneiderlin and Martial. Now onto the England team. After losing to Spain they will be looking to bounce back imminently. 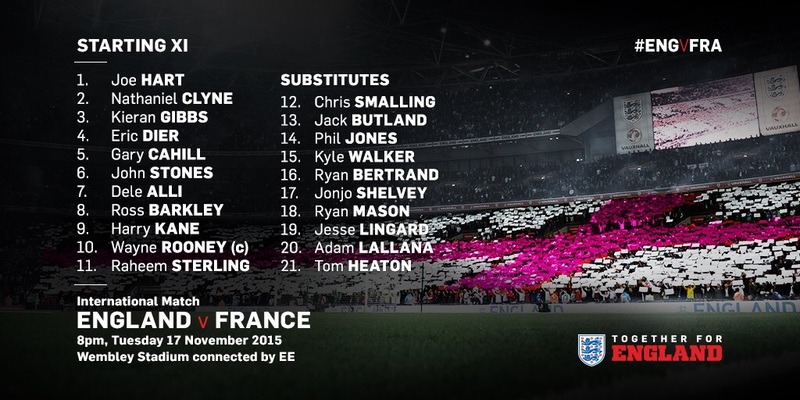 Joe Hart starts tonight and provides the English team will that star-quality and stability in goal. Two fantastic goalkeepers in Lloris and Hart will be on show tonight. I am impressed with our defence in Clyne, Cahill, Stones and Gibbs. The pace of the full-backs will be vital for us tonight in Clyne and Gibbs. Cahill and Stones are both two very strong defenders but they really do need to be completely focused for the match since our defence tends to make basic errors under pressure. The midfield has a youthful approach in Dier, Alli and Barkley. I do think that it will be a tough game for them but their energy and ability show provide England with a great chance to get the result that we want. It is surprising to see such a young midfield but I believe that Roy knows what he is doing- these players should be aiming to compete with the very best in Europe. In particular, Barkley is nothing short of stunning and spectacular when he is in his prime. Dier may act as a CDM but it will be interesting to see where Roy Hodgson plays him exactly. 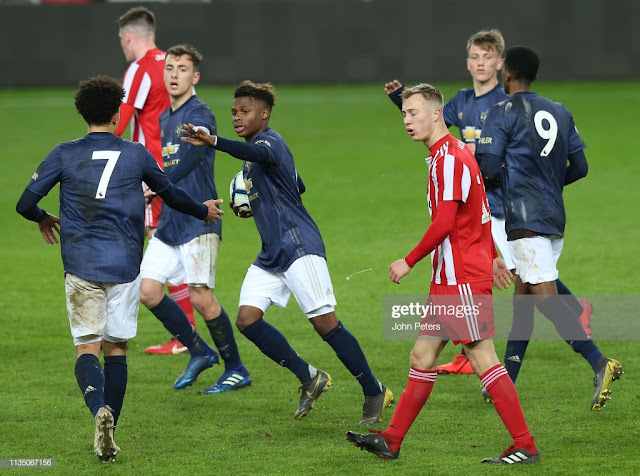 I think that Roy made the correct decision in not starting Jesse Lingard since he only got his first senior call-up this week. 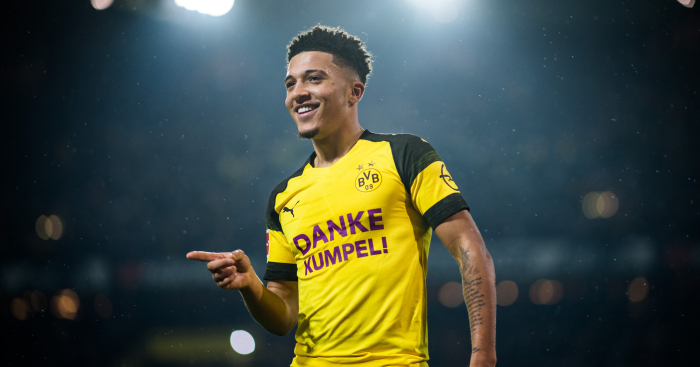 Although I really do want Roy to play him in the second half, he could be a unique assest for our squad. England's attack looks very promising tonight. We anticipate that the formation will be a 4-3-3 with Rooney in the middle with Kane on the right and Sterling on the left. The front three certainly have goals in them so it will be important to see how they gel together tonight. The Rooney-Kane partnership is especially important since these two forwards are most likely to lead our attack next summer in France. Wherever you are, sit back, relax and enjoy because this match should be a cracker! The first half of this particularly poignant clash between two international sides who are looking to give youth a chance wasn't dominated by either side. Both sides played great football at times, especially England using their full backs, RB and LB, a lot when on the attack. Kieran Gibbs and Clyne were given more freedom especially since to get forward and make more threatening runs at the heart of the French defence. A very surprising change from Roy Hodgson was the exclusion of Chris Smalling from the starting XI, very surprising taking his recent surge in form for club and country. Maybe because of the hammering England suffered at the hands of the Spanish, which in our opinion wasn't just the defences fault but an error in tactics coming from the top, Roy Hodgson. However this could be a problem as Hatem Ben Arfa and Anthony Martial caused a couple of wayward problems here and there to Stones and Cahill. For the vast majority of the half our defence was sound and when needed, Hart would rush out showing his intelligence and reading of the game. Harry Kane saw a lot more of the ball however still wasn't enough. He held the ball up well to let Barkley, who wasn't as influential in this half compared to his game against Spain, and Rooney join in, in the attack. 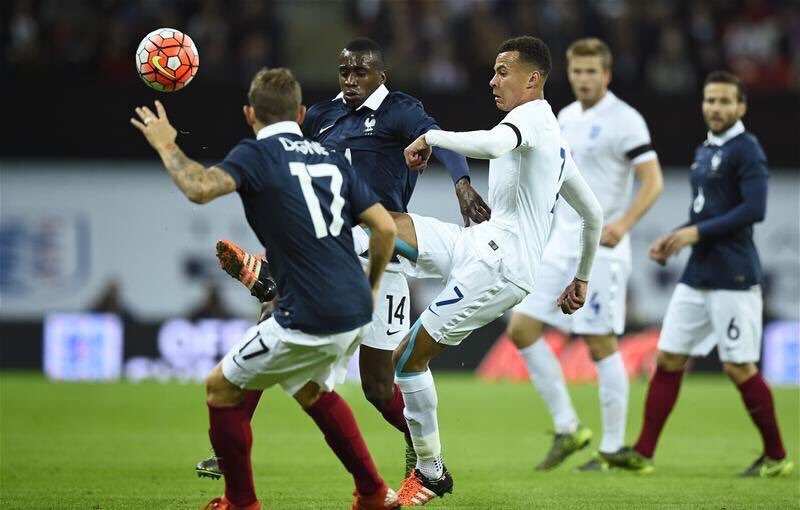 Dele Alli also came and made a couple of great runs and troubled the French defence. However his first touch wasn't always immaculate which is needed now that he plays in the top tier regularly. The build up is there for England but the final finish is what's lacking. But when the finishing is there we get some spectacles: The goal was absolutely amazing, a thunder bolt of a shot from outside the box from Dele Alli. What a goal! And what a player he might become, the future is looking bright! Even though neither team dominated possession, England would hang back up and pounce on the counter with pace from Raheem Sterling, Strength from Barkley and goal threats from Kane and Rooney.The team would nudge the ball forward slowly, picking their passes and making sure that they retain possession unlike the shambles we saw during the Spain match(25% possession at one point!) and especially take advantage when French players like Ben Arfa and Cabaye falling complacent and sometimes neglecting their defensive duties. Which actually shows how alert and eager our team is. 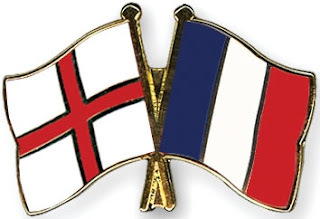 England lead France at Wembley by one goal to nil. 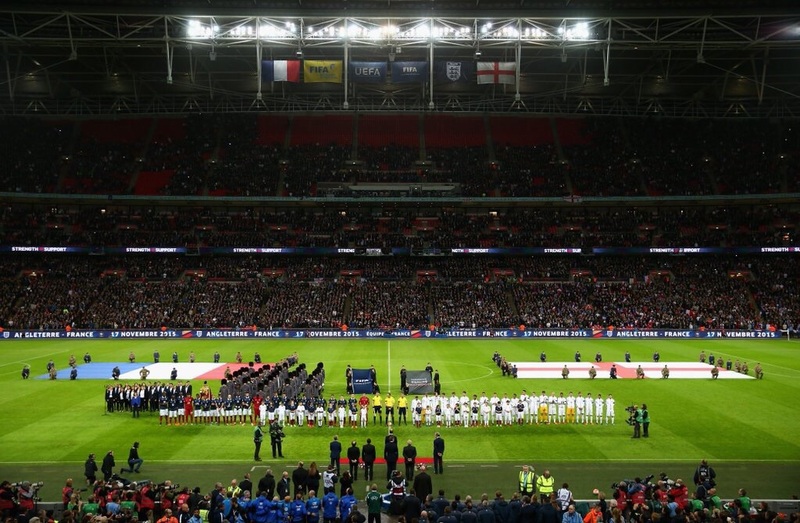 Overall it was an encouraging performance by England as they beat France 2-0 at Wembley. Huge respect to France for even showing up to play the game tonight after the tragic event of the Paris attacks last Friday. This was an example of Solidarity at its finest. There was a half-time change as Jack Butland replaced Joe Hart in goal to earn his 3rd cap for his country. England started the second half brightly and scored a brilliant second goal by our captain Wayne Rooney as Sterling crossed the ball from the left to Rooney who vollied the ball into the back of the net on 48 minutes. England continued to exert their dominance when Harry Kane had an ambitious shot 30-yards out which was inches away from the post in the 51st minute. Paul Pogba came on for France and made a real difference. He upped the tempo and had a good shot which was just wide. Olivier Giroud and Lassana Diarra came on in the early stages of the second half. The fact that Diarra played was both brave and humbling considering how his cousin was tragically killed 4 days ago. England then dropped off during the second half and allowed France to slowly get back into the game. 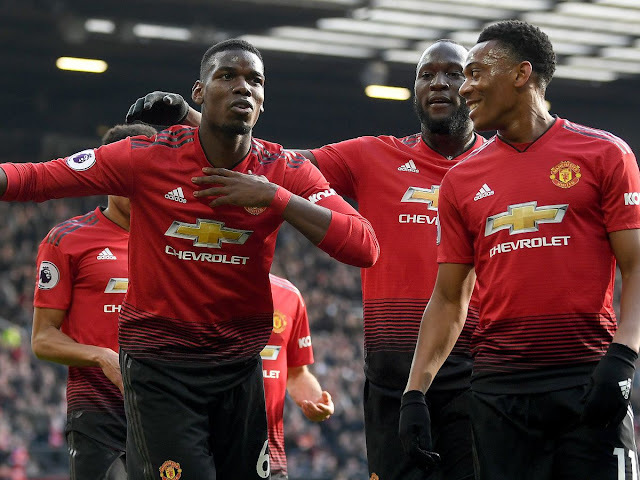 Pogba was continuing to be influential as he linked up skillfully with Martial to produce a brilliant save from Butland who has been in impressive form. Dele Alli was a class act during the second half as he showcased some of his strengths including his energy, pace and physicality. Griezmann then came on for Martial whilst England also made a substitution with Lallana replacing Sterling. Lallana had been criticised for a 'lazy' performance against Spain last week. With 20 minutes to go, England were still in control although France did manage to inflict more pressure on England and played with more passion. England then made two substitutions, Kane and Barkley came off for Bertrand and Shelvey as Bertrand earned his 7th cap for his country. The performance of England was a much improved one in contrast to the game against Spain. France made another substitution, bringing Sissoko on for Schneiderlin. There were several stand-out performances in the England side. For example, John Stones was very composed throughout the game and even glided past the French midfield at one point. Eric Dier was great tonight in the heart of the midfield. Dele Alli received 'Man of the match' for his efforts and was then substituted in the final few minutes for Phil Jones who made his 20th appearance for the national team. With 2 minutes of added time, England held on. It was a successful performance that was watched by a crowd of 71,223 fans. Lingard did not play today which was disappointing for us United fans but I have no doubt that he will feature for England some time in the near future. The game was entertaining which was courtesy of the two teams playing to a good standard of football despite the occasion and the events that surrounded the game. 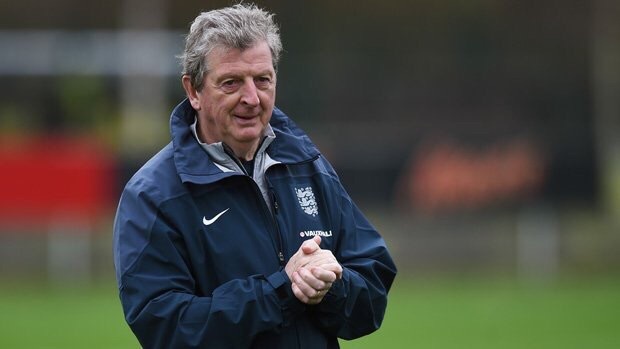 Going forward, Roy Hodgson now has several selection dilemmas in different positions. To end, I would like to congratulate both teams and in particular France for playing tonight. Hope you all enjoyed the game! 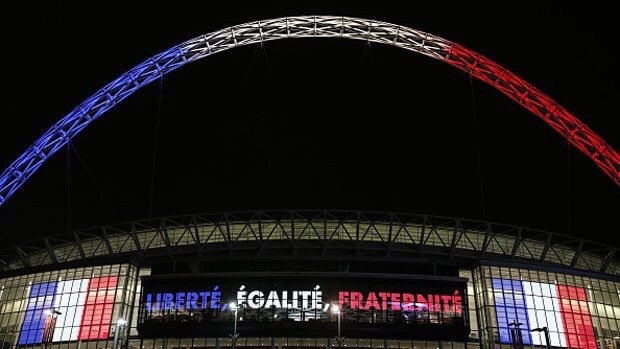 Well firstly to say what an emotional, heart wrenching and moving night it was at Wembley stadium as England met France on the football pitch, even if the evening’s main attraction was not the beautiful game being played out on the field. The fact that this match was being played at all, was a strong show of defiance by the football world, even though other matches (namely those in Belgium and Germany), fell foul to the threat of terror. Tonight, the game at Wembley still managed to go ahead despite the fact it was against the backdrop of a much needed strong armed police presence. My personal highlight actually came before the game of football had even began, during the moving serenade of the French national anthem La Marseillaise, which was sung by both the English and French faithful, following this came a number of other touching tributes to the 129 whom sadly lost their lives in the horrific Paris terrorist attacks, among these was the placing of a reef with Prime Minister David Cameron as well the Duke of Cambridge being present, along with an impeccably observed minute’s silence which seemed to leave French and Atletico Madrid superstar Antoine Greizmann on the verge of tears since his sister was actually one of the people who were held hostage in the Bataclan theatre on that fateful Friday night. Now onto the actual match which was a surprisingly entertaining affair and was even played at a high tempo for many parts. It was the French who had the better two early chances, with Cabaye firing just over Joe Hart’s bar, before Anthony Martial showed why there has been so much hype about him with a spectacular dribble which took him past Nathaniel Clyne, however, he was only to be stopped by a quality save by Butland in the bottom corner. The question at this point was: would the French rue squandering these early chances? This question was answered later in the first half, following a succession of missed opportunities by the United captain it was actually the young Delle Alli who stepped with a truly audacious effort from 25 yards out to give England the lead and his first senior international goal. This lead was then doubled just 3 minutes into the second half when Manchester City’s £49 million man, Raheem Sterling whipped in a exquisite ball to the near post which Rooney gleefully tapped in from just 6 yards out. One of the most emotional points of the game was when France bought Lassana Diarra on at around the 60 minute mark, Diarra was rightly given a standing ovation by the entire Wembley faithfuls after choosing to take part in the match despite the devastating passing of his cousin Asta Diakhite in the Paris terror attacks. Following this the French team began to ask some questions, however, only really tested England substitute keeper once in the 65th minute after a clever one-two between Pogba and Martial. So it was to be England who ran out 2-0 victors and perhaps showed what a force they could be in France this Summer however truth be told tonight was a night in which the result score line was not what mattered, as tonight Wembley showed the unity, togetherness and respect that football is all about. As England and France stood shoulder to shoulder in the face of adversity and showed the globe how beautiful our game really is.